Over the weekend, I finally did something that’s been on the list for a while and moved my site over to JennieCoughlin.com. After enough messing with DNS and other geeky details to remind me why I like the content side of being a digital editor, not the production side, it’s up and running — and redesigned. Everything that was here is now over there, but so far everybody has said the new site is MUCH easier to navigate. If you get a chance, head on over, check it out and let me know what you think! Animals, an amoeba and Arabian minarets — can’t wait to see the stories that come out of this week’s challenge. Ready for Week 3? 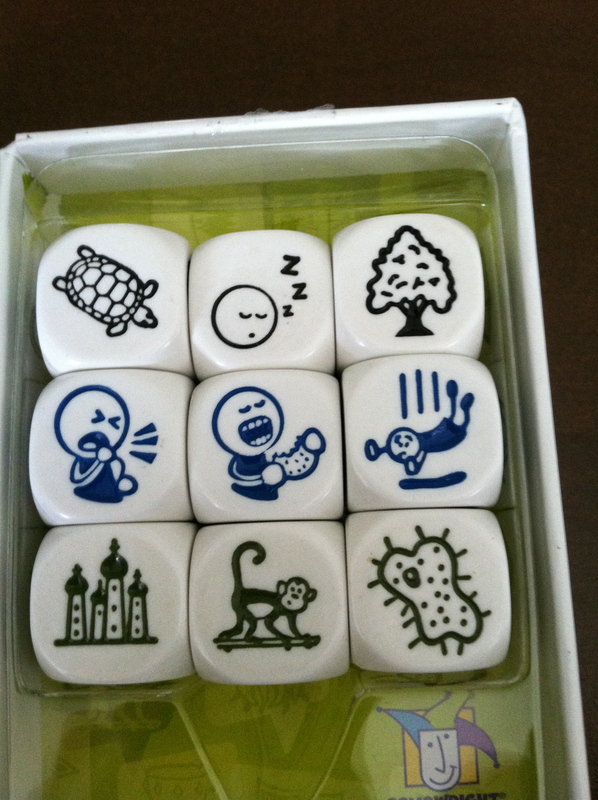 Hope everybody finds a treasure of a story in this week’s cubes. After seeing this week’s cubes, my mind went to one particular setting. I wonder how many of yours will go to the same one? 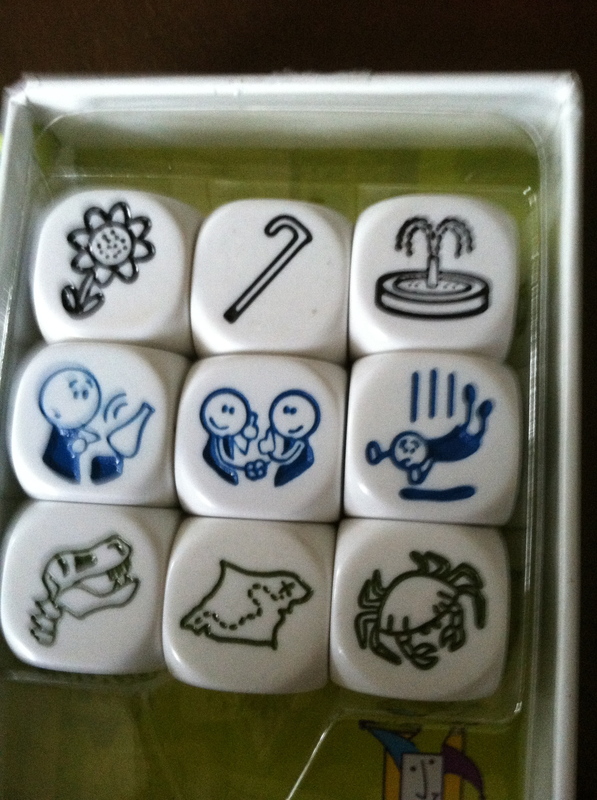 Last week I was making the rounds wearing my Author Jennie hat in both Massachusetts and Virginia, and I spoke to a lot of people about Rory’s Story Cubes and the Story Cubes Challenge. So now it’s time for Round 4 of the challenge. 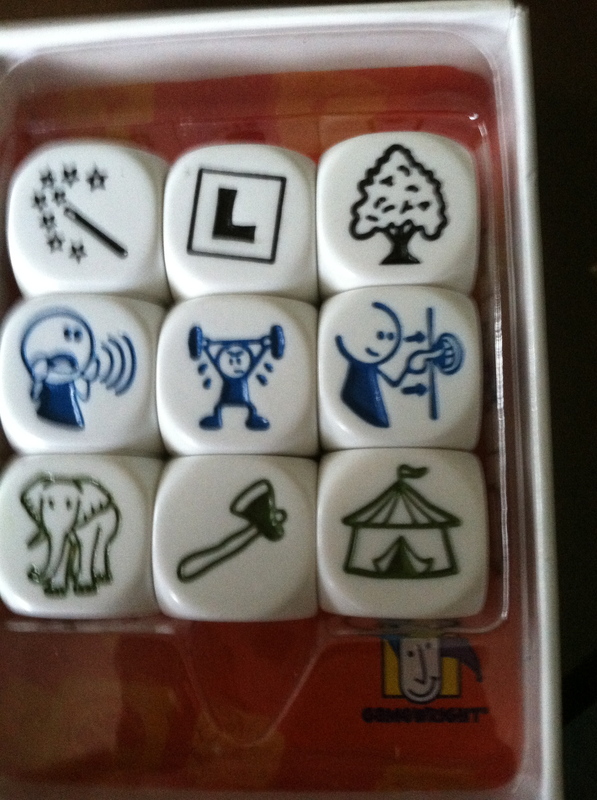 Like Round 3, this one involves three cubes each from the original set, Actions and Voyages. 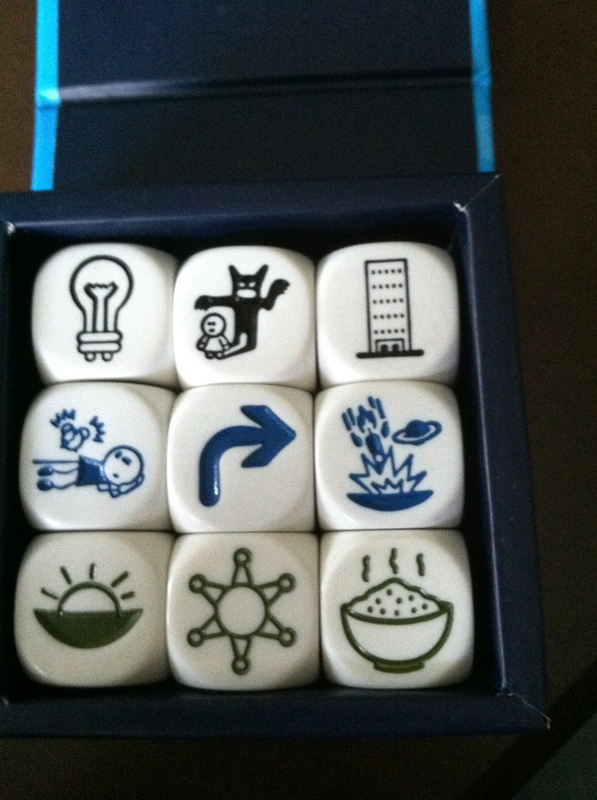 If you’re new to the challenge, here’s the scoop: I post a photo of nine Story Cubes on Wednesday morning. You write a story using all nine cubes. If you want to post a link (or the story itself) in comments, go for it! If you’d rather keep it to yourself, that’s fine, too. Teachers and librarians, I’ve done some workshops recently on writing using the cubes, and if you’re close enough for me to get to, I’m happy to do something for your facility. Just email me and we can talk details. Jason Collins’ announcement today in Sports Illustrated — the first active male pro athlete in one of the major US leagues to come out of the closet — is historic. It also highlights an interesting challenge I had when I was first developing Exeter and the characters — specifically, Dan Reilly. If you’ve read any of the books, you know Dan is gay. He also was a football player, and in the mid-1990s, he was both openly gay and playing high school football. Dan’s just a year or so older than Jason Collins. Massachusetts is a fairly progressive state, but that’s so unusual as to be implausible, at least on the face of it. Frankly, if I’d consciously built the character that way… Well, I probably wouldn’t have. The original story I was trying to tell in what was supposed to be the first book had Dan as a main character, but not THE main character. Ellie was the main character, and at the time it takes place, she’s just moved to Exeter and ended a longtime relationship. I didn’t want readers thinking she and Dan were going to get together. And I read enough fanfiction to know that it often doesn’t matter what the author intends — readers will have their own opinions about character pairings. So I started thinking about the characters and my options. I knew a lot about Dan at that point, but not his family. (Liz was not yet his cousin — she wasn’t even a townie.) Realistically, there were two options for putting him off-limits. He had to be happily married. Or he had to be gay. (As it turned out, he was both.) I first thought married. But I knew Dan well enough at that point to know that if he was married to a woman, he’d have a few kids by now. And I knew that wasn’t right. So I wondered if he was gay. It took about 30 seconds for me to realize that was the case — it was the missing piece that made the character come alive. Chris came to life later. But that left me with an interesting dilemma, because I already had the football background in there. I knew enough about his personality to know that hiding something that big wasn’t in character. So then I had to figure out what would make a high school football player come out and play football — and make pretty much everybody else accept that. There’s been some commentary — and Collins himself alluded to it in his essay — making the point that Collins can come out in part because he is such a tough, ferocious player. He defies any stereotype. How does a high school kid get that rep? How did Dan earn enough respect that he could have plausibly done this? I also knew at this point that the Irish mob was in Exeter. That ended up being the answer. Dan had taken on the mob and won — he’d earned respect from enough people that he wasn’t going to lose it by coming out. Today, a young, gay football player doesn’t need such an extreme situation. But this was in the early 1990s, more than 20 years ago. It had to be an extraordinary set of circumstances. The marsh mess also ended up explaining a great deal more about several other characters, things I hadn’t fully grappled with at that point. Dan only exists in my head. Jason Collins is the man who actually took this step to come out while playing. I’m hoping what he sees going forward is as positive as the initial reactions. The fact that it took until 2013 for any male pro athlete in a major sport to do so, though, reminds me of why a fictional character had to face down the Irish mob to do something similar in 1991.